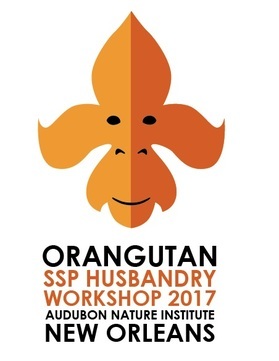 Mark you calendars for the 2017 Orangutan SSP Husbandry Workshop! The 2017 workshop will be hosted by the beautiful Audubon Zoo in New Orleans, Louisiana. Cheryl Knott is a biological anthropologist who conducts research on wild orangutans in Gunung Palung National Park, Indonesia. She earned her PhD in Anthropology from Harvard University, where she also served as an Associate Professor until 2008, when she joined the faculty at Boston University. Dr. Knott has been studying wild orangutans in Indonesia’s Gunung Palung National Park, on the island of Borneo, since 1992. She is the founder and director of the Gunung Palung Orangutan Project, one of the longest running primate research projects in the world. Her work reveals how orangutan adaptations, such as the longest inter-birth interval of any mammal and the evolution of two adult male morphs, are shaped by their ecology. She pioneered the use of non-invasive techniques to measure orangutan hormones, caloric intake and physiology in the wild. In 2000, she co-founded the Gunung Palung Orangutan Conservation Project which works to protect this critically endangered species, and their rain forest habitat, through education, public awareness campaigns, population and habitat censuses, sustainable livelihood development, establishment of village-run customary forests, investigation of the illegal pet trade and active engagement with Indonesian government organizations. Dr. Knott is a National Geographic Emerging Explorer, has published over 50 scientific articles, and is the recipient of numerous grants and awards for her research and teaching. She collaborates with her husband, National Geographic photographer Tim Laman, on creating popular books, articles and films on orangutans to help the public develop a greater appreciation for these magnificent animals. We will be hosting a silent auction at the workshop and we need your help to make it the best year yet! We are in need of auction items and your participation. Please see the attachment for the auction item submission form. If you are bringing your item with you to the workshop, this form will be available to you at registration. If you wish to send your auction item ahead of time, there is an address provided on the form to do so. Please be sure that the form is filled out and sent with the item. Get creative and have fun in the name of orangutans!!! Thank you in advance for everyone’s submission and support for the Orangutan SSP. We look forward to sharing New Orleans with you! For something a little different from what the usual post workshops offer, we invite you to participate in some conservation efforts here in Louisiana. It will give you a chance to help restore our wetlands, which ultimately helps the planet. Our environment here is like no other and we cannot wait for you to be able to experience the mysterious beauty of our swamps and wetlands. If you aren’t afraid to get your hands dirty to help plant some trees, this experience is for you! We are all in this profession to help save species. Many of us always say we want to get more involved to help…October 5th is your chance to make a difference! We will be working with The Coalition to Restore Coastal Louisiana (CLCR), who work closely with other organizations to restore the wetlands in many ways from planting trees and grasses to restoring oyster beds with recycled oyster shells. Not only do your efforts help CRCL in a tremendous way, but by planting in this area of new land, you will help increase soil retention and promote more land growth! Details of the trip are being finalized as the salinity of the water will determine which planting site we will be supporting. CLCR will provide gloves, boots, and tools so no need to pack these items in your suitcase! All you will need is some comfortable clothing that can get dirty. Here, you will have the chance to register, purchase our fabulous workshop T-shirts, and register for our amazing Post Workshop Trip. Early bird registration ends August 1st at $200. Register now before the more expensive price kicks in! Don’t forget to book your hotel room soon before they start giving our rooms away! We wanted to let you know that we have added some updates to the website with more information on the 2017 Orangutan SSP Husbandry Workshop! Keynote Speaker announcement!!!! We are super excited! Please ensure you book your hotel room by June 30th. This is when the hotel will start giving our rooms away out of our room block! CALL FOR ABSTRACTS AND POSTERS!! If you have any questions or issues, please contact us! We look forward to having an inspiring and informational workshop! Please book your rooms before June 30, 2017. ** That is when the hotel will begin looking at our block of rooms and start giving them away. It will be difficult to find a hotel room at a reasonable price at this time of year here in New Orleans. Please book your reservations by calling 1-866-311-1200 and requesting the group Association of Zoos & Aquariums/Orangutan SSP Workshop (coded AZA in our system) and the dates or book online at the website.